This past June my sister and I biked along the trail that runs parallel to the Schuylkill River, and we returned on a warm October afternoon to head in the opposite direction and try out the new addition to the path, the Schuylkill Banks Boardwalk. Officials opened the new leg of the path just several weeks ago. We bicycled past the view of Boathouse Row and around the back of the Philadelphia Art Museum and alongside of Waterworks before coming to the over-the-water extension. A viewing area above the walkway at Locust Street gave us a vantage point to take photographs up and down the river. On a Tuesday afternoon, there wasn’t much pedestrian traffic so the four-block ride to the end at the South Street Bridge in West Philadelphia took about ten minutes. Along the trail the boardwalk widens with benches so we could pause and view the cityscapes. The walkway serves as a practical walking path from 30th Street Station to the Art Museum. Normally, I would take the subway from 30th Street and get off at 22nd Street, and then walk to the Art Museum. 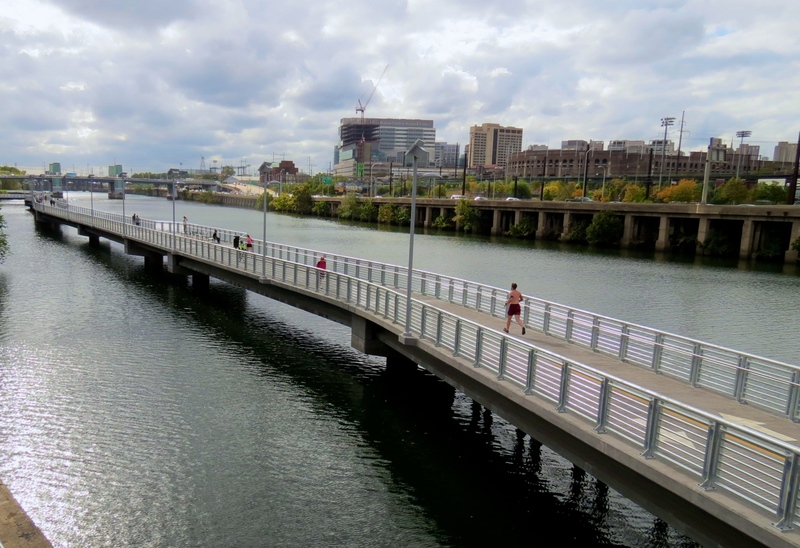 Now the walkway conveniently connects those locations while enjoying the beauty of the Schuylkill River. Philadelphia is a city I must visit someday. It must be just alive with history. Thank you for these great looks at Philadelphia. Can find many places to visit in Philly. . . hope to return to one of the mural tours as they have made many recent additions. http://muralarts.org/tour Thanks for stopping by! Had my first trip to Philly this summer and I loved it. Riding the Schuykill bike path was something I really wanted to do but I didn’t have enough time for it. Well, I’ve lived near Philly all my life and I’m now just getting out to visit the many scenic spots. Perhaps you’ll come back some day. I hope to get back to Michigan.